How we're getting our whole community to sustained health. 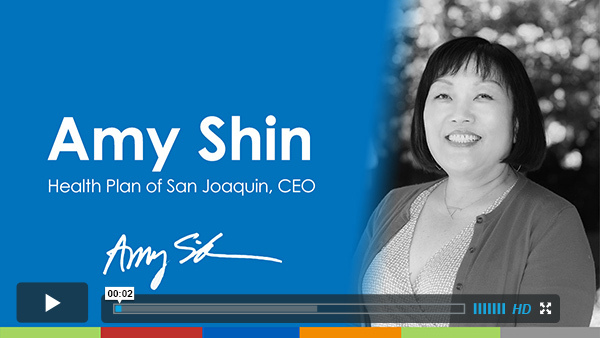 CEO Amy Shin on what it really takes to cultivate a healthy HPSJ membership. Clue: It takes a whole village, located within a landscape that not only is broadly viable, but also is buoyant, robust, and attractive to natives and newcomers alike. Read the transcript here. About 41% of San Joaquin & Stanislaus County residents have Medi-Cal coverage. 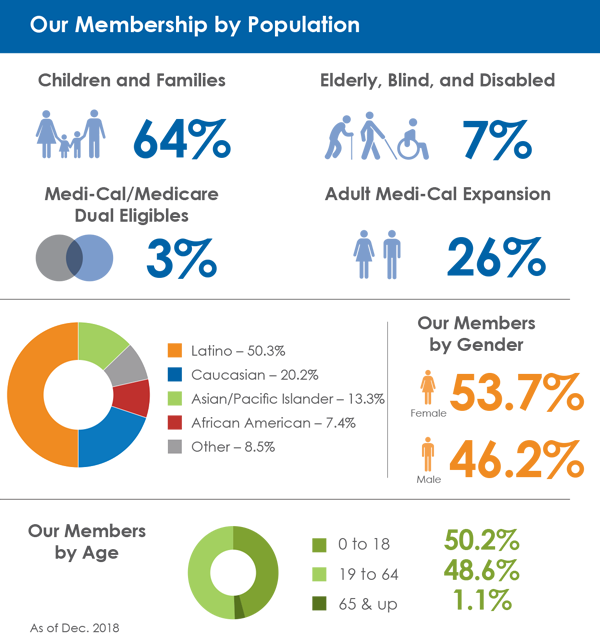 Throughout 2018, Health Plan of San Joaquin membership was about 350,000. Our members exist in a landscape filled with factors that will determine their health, from everyday food and housing insecurity, to culture and language differences, to no reliable transportation, to illiteracy that makes it difficult to follow doctor's care instructions. Many members have competing priorities, such as inability to slip away from a job for a medical appointment. Nearly 1 in 5 adult Medi-Cal enrollees in San Joaquin and Stanislaus County does NOT have a car for regular use. A modern, first-rate local health care workforce that encompasses measurably effective health care practices, leverages finite dollars, and shrewdly invests in technology – all to support a culturally and linguistically diverse, rural and urban, and economically challenged community, all with high need children. Established Career Ladders and Jobs Families to help groom employees and promote from within so they can go as far as their ambitions and our educational support can carry them within HPSJ – and, hopefully without leaving HPSJ. HPSJ-U – Built and opened our own online educational hub for employee-required course work, as well as online classes to help any staff member qualify for the next level or a new position here at Health Plan of San Joaquin. HPSJ-University has already turned into a popular, in-house benefit – and a well-received external recruiting enticement. 14 Health Careers Scholarships were awarded in 2018; and we raised the award amount from $2,500 to $3,000. Professional staff from across HPSJ functions served as mentors for each HPSJ Health Careers Scholar – most are the first in their family to attend college. 25 continuing education scholarships were awarded to past scholars still in school - $1,000 each. SURF, Stockton Urban Revitalization Fellows – an innovative new program from the office of Stockton’s Mayor Michael Tubbs; HPSJ engaged one of the first SURF fellows – a UOP graduate working towards becoming a doctor. Annual market survey conducted to assure HPSJ is offering competitive salaries and then adjusted compensation as appropriate for the regional marketplace. HealthForce Partners – in 2018, HPSJ helped found, fund, and fill volunteer leadership positions for this new entrepreneurial collaboration for San Joaquin and Stanislaus counties. Under the growing HealthForce Partners umbrella, we are myriad nonprofits, employers, educators, and recruiters coming out of our isolated (if well meaning) silos, to together pool our limited resources and swim in the same direction, toward the common goal of a fully staffed work force for health care and all the many related jobs throughout the region. All of these initiatives will take time to bear fruit. But taken in combination, with commitments and synergies, they are the most sustainable and practical ways to lessen critical shortages of doctors, nurses, pharmacists, and health tech specialists devoted to the well-being of our diverse community. What to give for a Tenth Anniversary? – More HPSJ Health Careers Scholarships! In 2018, we again partnered with seven local schools and programs for the 10th Anniversary HPSJ Health Careers Scholarships Program. We continue to invest in these future nurses, doctors, pharmacists, and tech workers. To date, 170 local students have been awarded this critical support. 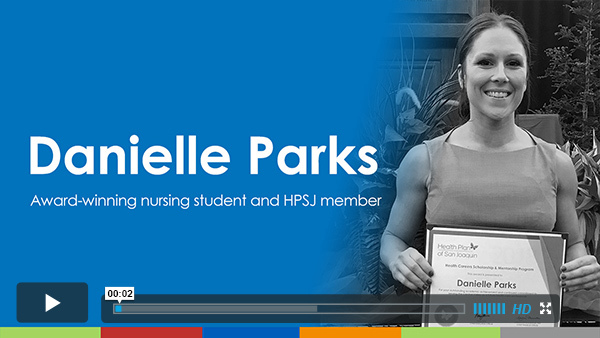 Here, meet one of our extraordinary 2018 HPSJ Scholars, Danielle Parks. Our public education and health promotion segments for the Oral Health Starts at Birth campaign (established in 2015), including HPSJ-financed provider reimbursements for fluoride use, continued throughout Stanislaus and San Joaquin counties. New for 2018 – we brought back the popular provider training for fluoride applications – but this time taking the sessions out to practices and clinics throughout Stanislaus and San Joaquin counties. In this way, our practical fluoride trainings grew to reach up to 6083 children (infants to six years). A large portion of the people we serve are low-income and have not had access to health insurance. They need help understanding and navigating a complex health system. They require culturally competent providers who speak their language so they can make informed health care choices. Families and children require support at the earliest ages, to capture kids in ways that set them up for future education & work success, rather than trapping them a cycle that leaves them further and further behind. In 2018 and going forward: The price of admission for HPSJ provider conferences – Health-related books donated for HPSJ to distribute to local kids. HPSJ has a long history of serving our members in partnership with safety-net and traditional Medi-Cal providers. For the convenience of members, and to allow them to connect with a physician if needed, HPSJ expanded to this extra service for whenever a member, or someone close, is feeling unwell and the nurse believes the situation warrants a physician consult. The HealthReach physician can issue a prescription at a local HPSJ pharmacy. After the phone consultation, the member’s provider is notified of the call and any prescriptions – a vital component for our managed care pledge to our members. In 2018, HPSJ partnered with key providers to initiate and help fund the eConsults platform implementation. With several provider groups, we teamed up to phase in systems set-ups, conduct trainings for practice staff and physicians, test finalized integration and reporting requirements, and then create a local panel of specialists. HPSJ is a not-for-profit, managed care public health plan offering Medicaid (Medi-Cal in California) to eligible residents in San Joaquin & Stanislaus counties. Share this HPSJ Community Report with your friends!